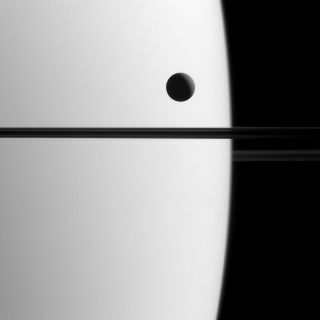 Saturn's moon Dione crosses the face of the ringed planet in an image obtained on May 21, 2015. An icy moon of Saturn hangs against the face of its giant parent planet in a breathtaking new image captured by NASA's Cassini spacecraft. The photo, which Cassini took on May 21, shows the moon Dione crossing Saturn's disk. Careful study of such "transits" can help astronomers better understand the orbits of Dione and other moons in the solar system, NASA officials said. Furthermore, NASA's Kepler space telescope and some other instruments hunt for exoplanets by looking for tiny dips in a star's brightness caused by transiting alien worlds. Studying the light coming from such extrasolar systems can also reveal details about the composition of these exoplanets' atmospheres. At 696 miles (1,120 kilometers) in diameter, Dione is the fourth-largest of Saturn's sixty-odd moons; only Titan, Rhea and Iapetus are bigger. Parts of Dione are heavily cratered, and the satellite's trailing side features mysterious ice cliffs and fractures that run for tens or hundreds of kilometers. Cassini has also detected a wispy oxygen atmosphere surrounding the frigid moon. Cassini snapped the new photo, which was released today (Aug. 31), when the probe was about 1.4 million miles (2.3 million km) from Saturn. The image's resolution is 9 miles (14 km) per pixel. But Cassini has gotten much closer looks at Dione, thanks to a handful of flybys over the years. During the most recent one, which occurred Aug. 17, the spacecraft zoomed within just 295 miles (474 km) of the moon's surface, returning a set of amazing images. The Aug. 17 maneuver was the last scheduled up-close look at Dione, however; no more close flybys are planned before Cassini ends its mission with an intentional death dive into Saturn's thick atmosphere in September 2017. The $3.2 billion Cassini mission, which launched in 1997 and arrived in the Saturn system in 2004, is a joint operation involving NASA, the European Space Agency and the Italian Space Agency.